《The five peas》PPT课件 第一部分内容：Review Do you remember the story? The five peas Five peas lived together in a pod. The peas grew bigger and stronger. One day, a boy picked the pod. They were very excited..
《The five peas》PPT 第一部分内容：Warming Do you know them? What are they? They are peas. What is it? It is a pot. What is it? Its a bullet. How do they feel? They are excited. What do you think of the koala? 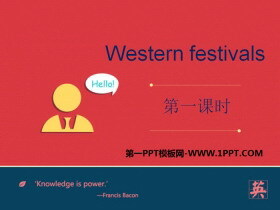 ..
《Western festivals》PPT 第一部分内容：Listen and number Christmas Thanksgiving Halloween Easter Read and answer 1.When is Easter? Its on a Sunday in March or April. 2.What do children usually do on Easter? The..
《Great storybooks》PPT课件 第一部分内容：Presentation What are your classmatesfavourite stories? Joes favourite story is the ugly duckling.Its about an ugly duckling.The duckling becomes a beautiful swan.Ander..
《Great storybooks》PPT 第一部分内容：Presentation Do you know these stories? The emperors new clothes The ugly duckling Snow White Cinderella Little Red Riding Hood ... ... ... 《Great storybooks》PPT，第二部..
《Reusing things》PPT 第一部分内容：Revision Lets read these sentences: 1. Can I throw away these bottles and cans? 2. We should keep them. 3. Because we can reuse them. 4. Let me show you. 5. We can reuse othe..
《Reading signs》PPT课件 第一部分内容：Revision Do you know these signs? A story The path of stones Pre-reading Do you know them? Hello, Im Jane. Hi, Im Jack. Hi, Im father. ... ... ... 《Reading signs》PPT，第..
《Help others》PPT课件 第一部分内容：Warming Learn the sounds kid dog sad chess kitchen apple summer welcome together afternoon computer strawberry Good afternoon, David! Practice Listen and say 1. camera 2. ca..
《Help others》PPT 第一部分内容：Presentation What is this? Its a bell. What is this? Its neck. Talk in pairs I have a dog. Her name is _________. She is _________(colour). She has a ________ around her neck. I..
《PE lessons》PPT课件 第一部分内容：Review I like I am good at. Warming Do you like swimming? What do you need for a swimming lesson? ... ... ... 《PE lessons》PPT，第二部分内容：Presentation We need a swimsuit..